66 MMS December 2016 mmsonline.com CNC TECH TALK Columnist With a list of tasks for students to master during your in-house training (your expectations), you must now come up with learning methods and content to address this list (your curriculum). The more you target your company's own specific needs, the more focused your curriculum will be. Many approaches are available, and opinions vary as to which method is best. Pick an approach that accomplishes your goals while staying within your time and cost budgets. PRE-DEVELOPED VS. YOUR OWN MATERIAL Several companies provide CNC training in a var iet y of for mats, including online clas se s, CD-ROM courses and self-study manuals. 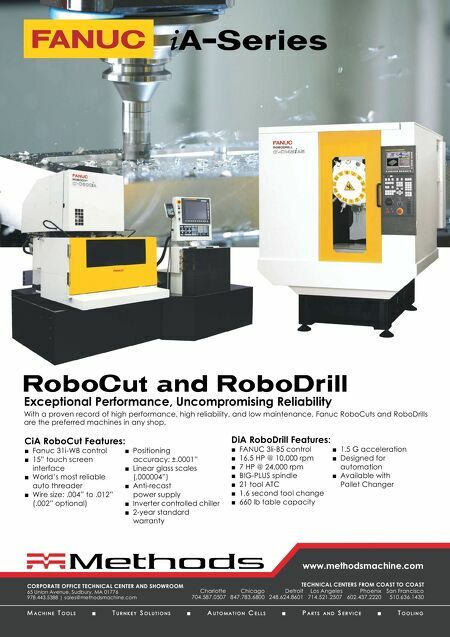 These training options tend to be somewhat generic, encompassing what the curriculum-providing company sees as general CNC machine tool usage. They may cover universal CNC topics pretty well, but will not address needs that are specific to your company. At the very least, you will probably have to add content to ensure that all of your company's special needs are met. You may additionally find that pre-developed CNC courses contain content that is not needed in or appropriate for your company. This means you will have to sift through the course content and choose just what you want your people to study. The alternative, of course, is to develop your own content. While this requires more time, it will allow you to more easily target those tasks you need your people to learn. Additionally, you can use your own words and the specific product- related terminology that is currently being used by your staff. An often appropriate solution is to incorporate both methods. Pick and choose content from a pre-developed course and supplement it with content of your own. This should minimize the time you will have to spend on course develop- ment and training while ensuring that all important topics are well-covered. The concern here is that you may come up with a disjointed curriculum. Since students will be learning from multiple sources, content may not nicely flow from one topic to the next. Regardless of how you come up with your curriculum, you must complete the assessment process described in last month's CNC Tech Talk c o l u m n. D o i n g s o e n s u re s yo u r c u r r i c u l u m addresses all of your training issues. SELF-PACED VS. INSTRUCTOR-LED TRAINING The "instructor" or facilitator that you ultimately choose for a CNC class probably has additional responsibilities. Indeed, a person with enough experience to teach CNC usually occupies a pretty important company role. This person may have limited time to develop a curriculum or to train new people, and/or they may even lack the desire to do so. 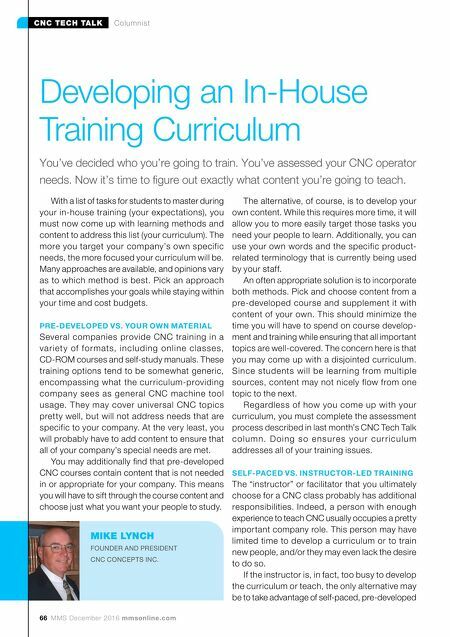 If the instructor is, in fact, too busy to develop the curriculum or teach, the only alternative may be to take advantage of self-paced, pre-developed Developing an In-House Training Curriculum You've decided who you're going to train. You've assessed your CNC operator needs. Now it's time to figure out exactly what content you're going to teach. MIKE LYNCH FOUNDER AND PRESIDENT CNC CONCEPTS INC.